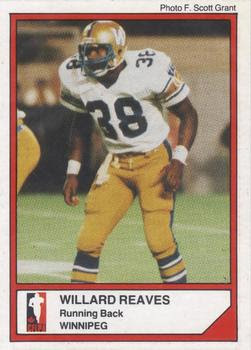 A Willard Reaves football card from 1987. It has been 31 years since he stepped on the field for the Blue Bombers, but Willard Reaves still feels the love from the Winnipeg fans. Known as the “No. 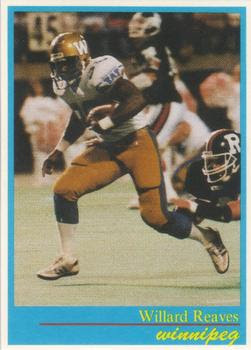 38 Special,” Reaves spent only five seasons in a Bombers jersey from 1983 to 1987, but he became a CFL legend leading the league in rushing on three different occasions. During those five years, the product of Flagstaff, Arizona, was the top running back in Canada. His best season was his sophomore 1984 campaign, where he was voted the league’s most outstanding player rushing for 1,733 yards and scoring 14 touchdowns on 304 carries in a 16-game regular season. He also hauled in 40 passes for 407 yards and scored four majors. Guided by Canadian Football Hall of Fame head coach Cal Murphy, the Bombers posted an 11-4-1 record to finish second overall in the CFL and romped into the Grey Cup game in Edmonton and thumped the Hamilton Tiger-Cats 47-17. The win ended a 22-year Grey Cup drought for “the Blue and Gold” at that time. In Winnipeg, Reaves is still a legend. He said he could have hit a unique milestone in his MVP season in 1984 and chuckles about how it was missed on one play. Willard Reaves in the 2008 Bombers media guide. “As a matter of fact, I did say I was going to rush for 1,800 yards and whatever,” said Reaves. “I think it was a game against Ottawa. I burst up the middle there for like 69 or 70 yards or something like that. Besides remembering his football exploits, Bomber fans also remember the time Reaves saved a man from drowning at a pool in a Winnipeg hotel in 1985. After his football career was finished, he made his permanent home in the Manitoba capital. Reaves said he still encounters fans all over the place in Winnipeg seeking his autograph. He admits he is impressed he is still remembered. “It is such a great town,” said Reaves. “Even now (and) when you are playing of course, they are coming up to you and getting autographs. They just want to come and sit and talk to you and stuff like this. 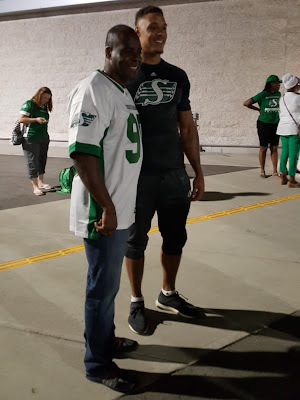 When he played, Reaves said the passion Bomber fans had for their team compared to the passion that Saskatchewan Roughriders fans have for their club. A Willard Reaves football card from 1985. The 1984 Grey Cup was a big deal for the Winnipeg faithful, because the Bombers were facing a Hamilton team that was quarterbacked by former Winnipeg star Dieter Brock. Brock was traded out of Winnipeg during a messy divorce late in the 1983 campaign for fellow pivot Tom Clements, who happened to become a hero in Winnipeg. Brock had expressed frustration about his life in Winnipeg, which didn’t sit well with the Bombers faithful. Bomber fans were wearing “Brock Busters” T-shirts during Grey Cup week in 1984. Reaves remembers the atmosphere created by the 60,081 spectators at Commonwealth Stadium being in a frenzy. 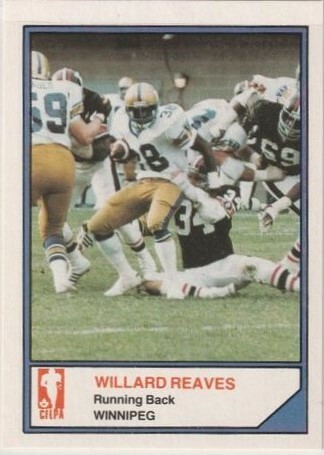 A Willard Reaves football card from 1983. “It was absolutely nuts,” said Reaves. “I didn’t see it, but I heard the train ride there was absolutely crazy. Reaves believes he had the personal success he did, because Winnipeg’s offence was well rounded at that time. He enjoyed watching the receiving corps that was nicknamed “The Untouchables” make plays catching passes from Clements. “It went both ways,” said Reaves. “We both complimented each other. “When they wanted to tee off and stop our running game, we just took to the air, and that was it. Of course, you have Joe Poplawski, Rick House, Jeff Boyd and James Murphy and stuff like that (as receivers), and then you have their backups. During his playing days in Winnipeg, Reaves gained a number of memories from the rivalry showdowns the Bombers had with the British Columbia Lions. The most memorable clash between the two clubs for Reaves occurred in the 1984 West Final at B.C. Place in Vancouver, which the Bombers won convincingly 31-14. The two clubs split their two regular season meetings in 1984. A Willard Reaves football card from 1984. “The (Grey Cup) game was fun, but the best game that we had was the week before, when we played the B.C. Lions,” said Reaves. “That we thought was our signature thing. “It was always B.C. and Winnipeg. We split on the regular season. We came out the Western Finals and went into B.C. Place and as noisy as it was and stuff like that we calmed it down real quick. 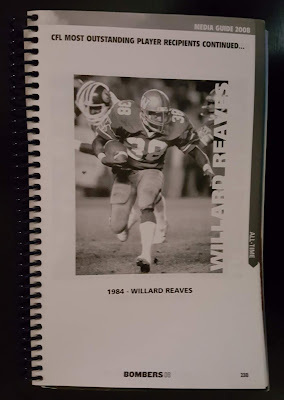 In 1987, Reaves played his final season with the Bombers having another banner year leading the CFL with 1,471 yards rushing and scoring nine majors on the ground to be named an all-Canadian for a third time. After that campaign, he elected to try his luck in the NFL and spent time over the next two seasons with the Washington Redskins and the Miami Dolphins. He only appeared in three regular season games in 1989, while the Bombers would win Grey Cups in 1988 and 1990. As a 59-year-old looking back at that decision, Reaves had no regrets, because he also knew his career after football was looming. “Football wasn’t my first love,” said Reaves. “That is why it made it so easy to walk away from the game regardless of what happened elsewhere. Willard Reaves, left, with son, Jordan. These days Reaves tries to watch his sons Ryan and Jordan venture through their respective professional sports careers. Ryan is a 31-year-old right-winger with the NHL’s Vegas Golden Knights, while Jordan is a 28-year-old defensive lineman and special teams ace with the Roughriders. With his old team experiencing a current league long 28-year Grey Cup drought, Reaves would love to see his Bombers reach the CFL’s pinnacle once again.